Catalog Page 7. Order 11" Tumbles Teddy Bears. Soft fur bears with printed T-Shirts. Catalog Page 7. Order 11" Tumbles Teddy Bears. Soft fur bears with printed T-Shirts. These bears and dogs have embroidered eyes. The price above includes the t-shirt or accessory with a one-color printed logo. The stuffed dogs are available in brown, black or gray colors. 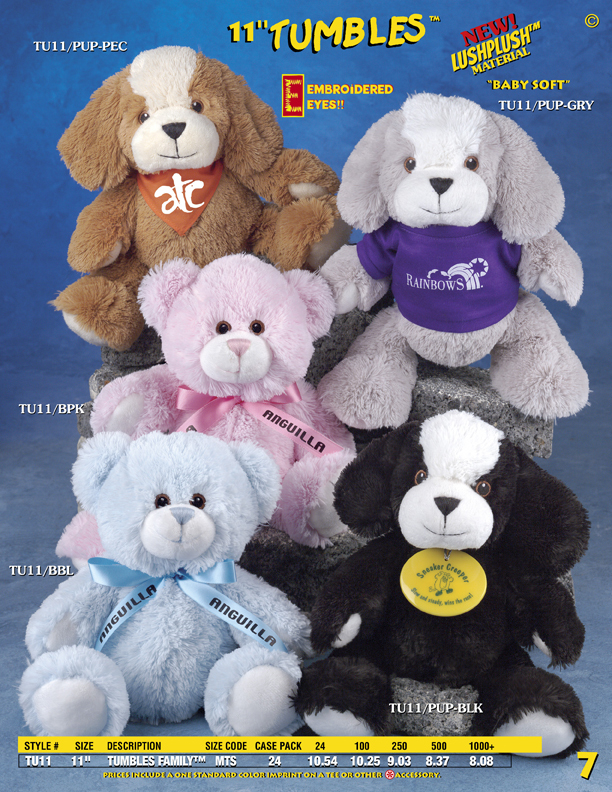 The 11" Tumbles bears are available in pink, blue, white, wheat, chocolate or pecan colors (see page 6 for additional colors). The lead time for production is 10 - 14 days.